Looking for a magic villa playhouse? 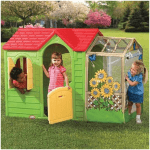 A fairy tale playhouse that will brighten both your garden and your life! With lovely details, this house has a lot of character and lots of opportunity for imaginative play for pre-school children over the age of 2 years. 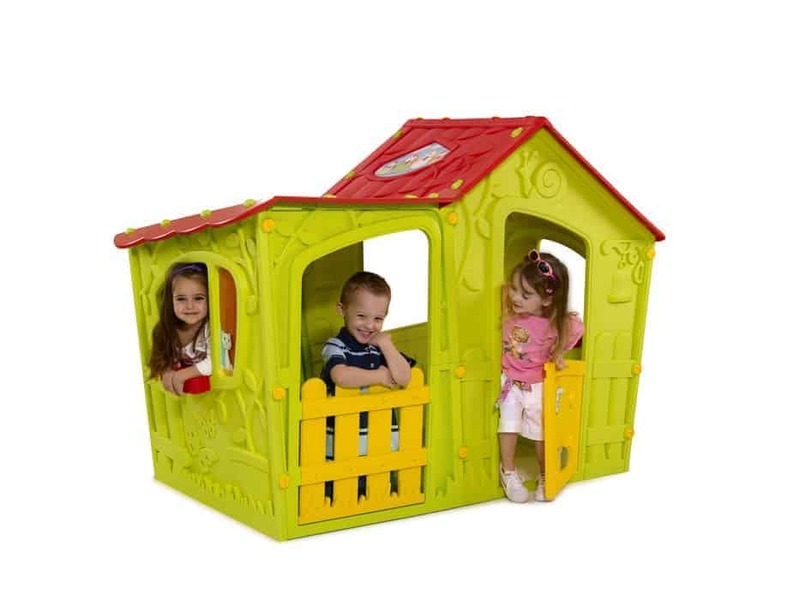 This is a superb, roomy children’s playhouse which is a very colourful bright green and red (other colors are available) complete with windows, a stable door and gate. The children will love playing inside and will enjoy hours of fun. Made from special injection moulded plastic it has plenty of graphics and pattern and will look bright even on the dreariest of days! It has the additional bonus of being easy on the pocket too and will take minutes to assemble. Suitable for age 2+. 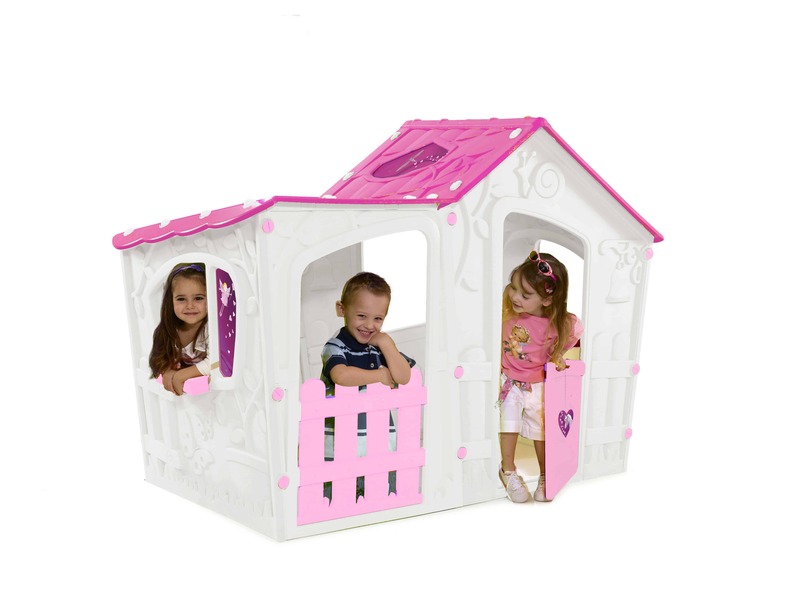 This playhouse has a fairy tale look to it, with its eccentrically shaped walls and roof. One of the fantastic features of this house is its openness, with all areas being able to be seen from the outside. 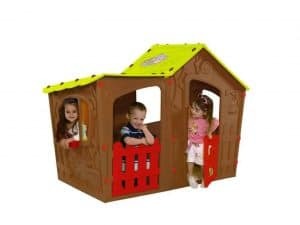 Being at the lower end of the price scale for playhouses, this product offers a great deal of character and fun, providing great value for money and many hours of fun and imaginative play to be had in it. See the video below for a closer look. 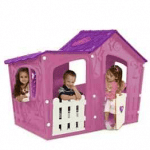 The Keter magic villa playhouse: How safe is it? Overall, the Keter range is renowned for its chunky, light-build nature that is safe for children of all ages. Its range of outdoor toys, vehicles and playhouses are the market leader and favoured by parents around the globe. However, even the best products may come with safety issues that need addressing. Below we look at any areas that may cause concern for safety whilst using the product. 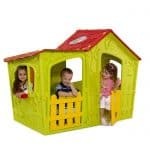 Windows: Unlike most of the Keter playhouse range, this particular playhouse has large open windows with no shutters. On one hand, this is great from a safety point of view as ever aspect of the interior is open to parental viewing and there is nothing that can trap little fingers. On the other hand, the large windows may be a temptation to climb out of for slightly older children so maybe adult supervision may be required to prevent them from seeing this as an alternative to the little door. Door/gate: At the entrance to the playhouse there is a small stable door/gate. Although anything that opens/closes may be of concern to parents worried about trapped fingers, this little gate is certainly lightweight and due to the stable door nature of the gate, and the fact that it will be opened and closed from above, we feel this poses little safety risk to your child. 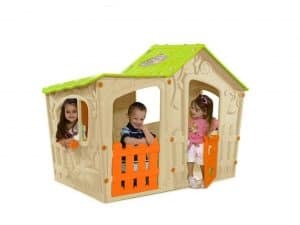 Overall, this is a safe and practically feature-free playhouse that would cause little concern for parents wanting to make sure that their child will be safe playing in the garden without any accidents taking place. The Keter magic villa playhouse: How easy to build? With any large object that you buy for your child, the number one question will always be ‘how easy is it to assemble?’ With this playhouse and the rest of the Keter range they are very easy to put together with their click and build technology. No messing around with screws, no sharp tools needed, no degree as a handyman required just click, click, click and you’re done. It really is easy, so easy in fact it just takes one adult to put it together in under an hour and then you can sit and relax whilst your child has the most fun they’ve had in ages. Just to make things easier we have included a link to the Keter magic villa playhouse instructions here. 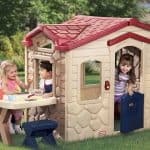 The Keter magic villa playhouse: What is the overall quality like? When you are looking for a playhouse to buy, you are subconsciously drawn to the Keter range purely because it’s a brand synonymous with great design, high quality materials and safety, all whilst putting the child’s needs at the forefront of everything. The special injected moulded plastic means that not only does this house look aesthetically pleasing to the eye, but it is also very sturdy, lightweight and durable. The mid-range price reflects the quality of the house but bear in mind that this will last you for many years to come so is definitely worth the initial investment. This playhouse is maintenance free and will endure even the harshest of weathers due to the high quality materials that are used in construction. Be careful with art products such as crayons or paint, etc, as they will come off but tend to be a little more stubborn during the cleaning process. 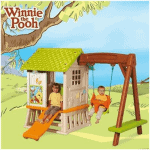 Our thoughts are that this is a great looking playhouse for many hours of imaginative play. From the wonderful Keter range, you can be sure that you will receive a fantastic quality house that will be played with for many years to come. This may be the playhouse for you if you just have one child, as it is on the smaller side compared to other houses within the Keter range. This little playhouse was a great buy for my 3 year old son. It is quite small but like I said, I only have one child. The price is high but I think that is because of the injected molded plastic that is made with it. I think that is also what makes it durable. This thing has sat out in the rain countless times and still holds up. My son has a blast in it. I like the fact that there is two small gates that open so it isn’t hard for children to get out of it. There really is no maintenance that I have done with it. It was overall a good buy for my son. The only reservation I have is with the size. I also only have one child but suffice to say that when a mate comes for a play date a few rows break out due to the power struggle among those in the terrible two’s stage. Also I found that cleaning it is a bit of a challenge when it is assaulted by a crayon. The “Magic Eraser” is a must with this model. Other than those few things, it is a good buy if you are looking for a one-child or max two child accommodation. It is good for mums that work around the house and want to keep the little ones around the house safely in watching distance.